Humans have this weird neurological tic where for some reason a lot of us derive pleasure from sounds that pretty much everyone, even the people who are enjoying them, can agree are terribly irritating. Look at the vuvuzela, which inspired global outrage but which at least some people thought was so great that they joined in on blowing them by the tens of thousands. In dance music you find it in the popularity of genres like acid house and moombahton, which are predicated on electronic noises that in any other context would signal the need to exit a building in a quick and orderly fashion. In noise music you find it literally everywhere. In pop music this pleasure at being annoyed has long expressed itself in the popularity of novelty songs. The best ones tend to be as irritating as they are amusing, hence the weird mainstream success of preternaturally nasal singers like Weird Al and Tiny Tim. "The Fox," by Norwegian comedy duo Ylvis, currently holding steady at number six on the Hot 100, is a perfect example. Sure, there's a little entertainment value in the comedic frisson between the preschooler lyrics and bombastic EDM setting, but not enough to warrant more than maybe one spin. 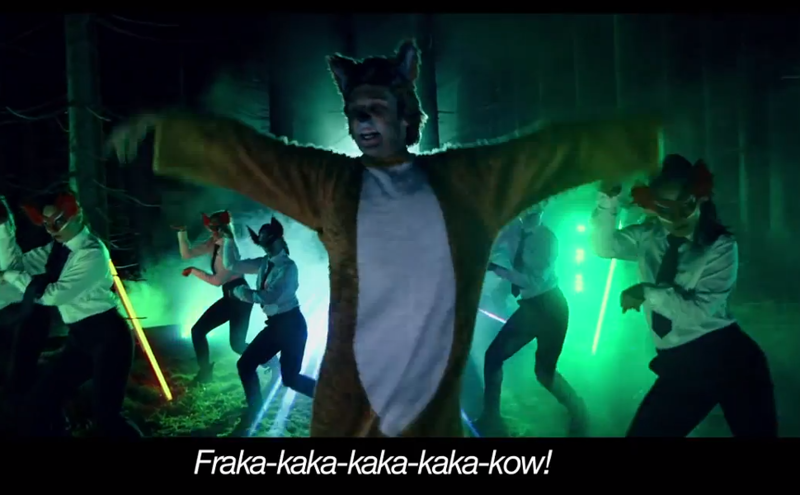 The only reason that "The Fox" can have tallied up over 172 million YouTube views of the official video alone is that people genuinely enjoy hearing a man shriek nonsense syllables in a falsetto voice over club beats. Which, as any fan of avant garde electronic music would tell you, is perfectly natural. It's just weird seeing it in the top ten. Ever since YouTube, American pop fans have developed increasingly sophisticated ways of satisfying their appetites for annoyance. Essentially, they've discovered outsider artists—previously an interest limited to hipsters and record geeks—and the gratifying sensation of hearing someone approach the pop idiom from such a perplexing angle that it'll stick in your brain even if you don't think it's good music. Rebecca Black's "Friday" proved that the sound of the corniest song money can buy, interpreted by a teenager with no formal training or natural ability, could somehow irritate people into listening to it hundreds of millions of times. "Chinese Food," by 12-year-old Alison Gold, is the first true heir of "Friday." Produced by Ark Music, the people behind Black's viral hit, it shares some of that song's DNA, but is somehow even more vapid: a wannabe club anthem, sung by someone nearly a decade too young to get into a club, about Chinese food. The music sounds like a Casio preset and the lyrics read like something written by a person with a head injury struggling to remember what kind of dishes a Chinese restaurant serves. ("Broccoli" gets repeated a suspicious number of times, but there are also these sharp little hooks in there ("Chow mu-mu-mu-mu-mein") that are worth suffering through the rest to hear and provide the masochistic pleasure to keep the plays coming in. It used to be that we could satisfy these weird annoyance-based listening habits privately. Now that Billboard's started counting YouTube spins towards Hot 100 placement it's become a lot more obvious. It's also funny to think that a song can now chart based on hate-spins alone, and that Gold and Ark Music's accomplishment of having bugged millions of people in an interestingly annoying way has earned them a spot, however small, in pop's history books. It also makes me wonder why Kyary Pamyu Pamyu hasn't had a platinum record in America yet.